Some people are ready to buy an insurance policy right now, but most people are not. If you could know in advance who was not going to buy, you could save yourself millions of dollars by not mailing to them. How can you do that? No one knows for sure, but a new customer acquisition method using prospect databases comes pretty close. Today, all insurance companies are actively renting lists of likely responders. They send them direct mail offers, hoping for a nibble. 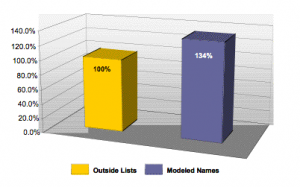 A typical mailer may rent 300 lists totaling several million names. After the mailing, he is required to erase these names from his mailing files, keeping only the one percent or less who respond. What does he learn from this process? He learns what lists work best for him, and which offer gets the best response. What he does not learn from this mailing is some vital information: which age group, income group, and ethnic group responds best. He would like to know who responds by housing type, family composition, lifestyle, and about twenty other key factors that we all know are important in finding the right insurance customer. Using prospect databases, some insurance companies today are able to select their prospects by these very factors, instead of what list they came from. The way a prospect database works is this. You rent names for an entire year, instead of for a single mailing. You keep the names in a database, and pay the owner every time one of his names is used. Because you have the names for a year, you can afford to append all sorts of demographic and behavioral information to the records, which you certainly could not afford to do if you rented the names for a single mailing. In addition, you can keep the promotion history in your database. Every time you mail a promotion to someone, you put that fact, the promotion used, and the date in the person’s database record. What kind of data can you keep on each prospect in your database? And about forty other important facts. With this information, you can build models that tell you which of the factors had the most influence in determining those who responded and those who did not respond. A good model looks at each of these appended factors and assigns it a weight (either plus or minus) which indicates how important it was in determining the final outcome (the person responded and bought a policy, or did not do these things). As you can see, with the model he mailed exactly the same number of pieces, but his response rate, sales rate, revenue and profits went way up. The only thing that went down was his revenue per sale. This chart is just the beginning of the benefits from a prospect database. A big part of the cost of any acquisition mailing is the payment for rented names. With a prospect database this cost can be significantly reduced. Let’s look at this one step at a time. Step One: Appended data. Most rented response names come to you with only the name and address. You do not know the age, income, length of residence or any of the many factors listed above which are used by a model to select the likely responders. To get this additional information, you have to have a service bureau, like KnowledgeBase Marketing or Acxiom, append this data to your rented names. This is not cheap. It will raise the cost of your mailing. There is a way around this problem. Step Two: Compiled Names If you rent compiled names such as AmeriLINK® from KnowledgeBase Marketing these records already have all the data you need already appended to them. What’s more, compiled names are about half the cost of the response names you have been renting. There is normally a catch in this, however. Half of the households in America never respond to direct mail. So, normally, compiled names (which are every consumer in America) usually get lower response rates than response names (which are people who have responded to direct mail and bought something). In this chart, 300,000 consumers were ranked by the model based on their likelihood of responding and buying a policy. 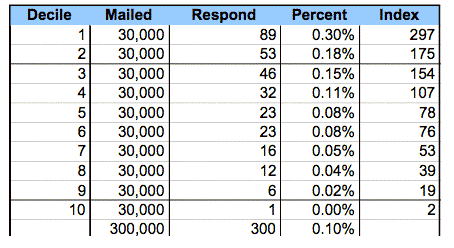 As you see, the top decile of 30,000 consumers had 89 sales with a response rate of 0.3%. The profit from the model comes from not mailing the less responsive deciles such as decile number 9 which produced only 6 sales. This is real knowledge which, used properly, can boost your response rate, sales and profits. Step Four: Scoring the names in your database. The end product of the model is an algorithm (a mathematical formula) which can be used to score a database of names to determine which decile each name falls into. As you see, he is mailing exactly the same number of pieces, 13.6 million, but his cost of renting names is about one third of what he had been paying before. Since compiled names already have the data appended, he had to pay for data appending only for his rented response names and for his house file names. Step Six: Mailing to Segments. You would not send the same mailing to a 65 year old prospect that you would to a college student. You would not send the same mailing to a couple with young children that you would to empty nesters. And you would not send the same mailing to someone with an income over $100K that you would to someone with an income of under $30K. To do your acquisition profitably, you should create segments of similar prospects, and send a mailing piece that was designed specifically for that segment. Renting response names, you usually do not have this kind of information, so you really cannot do much segmentation. With a prospect database, loaded with relevant data, every mailing can use segment-based strategy, with far higher response rates and sales. A major insurance company mails about 110 million pieces per year in 35 different campaigns. 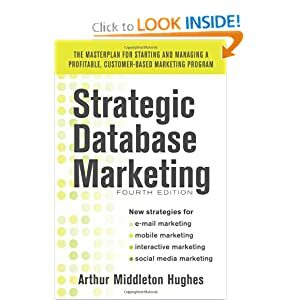 They built a prospect database of about 230 million US consumers maintained at KnowledgeBase Marketing using all of the steps listed above. They have built numerous models that predict responders to each of their 35 different campaigns. The database records are scored based on the models. They gained several benefits. 1) Faster Processing. Their prospect database is maintained ready to mail at all times. With a typical mailer, it may take six weeks or more to get a mailing out the door. 300 lists have to be reformatted and merged. With a prospect database, that process has already been done. All records in the database have already been scored by the various models so the marketers use their campaign management software to select the prospects and mail them out about a week later. Why is speed important? Because some of the rented names are hot list names: recent responders and new movers. They are in a buying mood. You need to reach them fast. 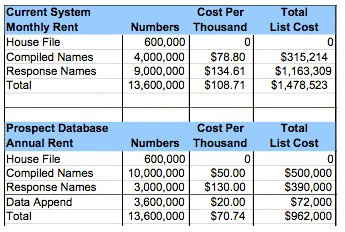 2) Lower Name Rental Costs. They are using about 80% complied names which cost them about half of what they were paying for names before. 3) Higher response rates. Because of the models, they select only consumers that are most likely to respond. As a result their response rates have gone up by 34%. 4) Total savings the first year: $1,000,000. Building the prospect database and the models was not cost free, of course. 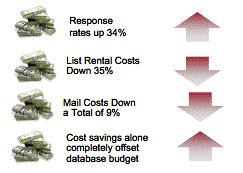 But the savings from using the prospect database paid the full cost of the database and the models in the first year. From then on, it was just gravy. It will be difficult to persuade some list owners to rent names for a whole year. You may be too small a mailer to have the clout to get everyone to agree. There are ways around all of these problems. Find a service bureau that will make all the arrangements for you. A large service bureau has the clout and experience to persuade brokers and list owners to agree to the terms. Such a service bureaus have modelers available. The service bureau is really essential for a prospect database because the bureau becomes an independent intermediary who will maintain your database impartially, giving all list owners their fair share of the revenue. In some arrangements, the list brokers and owners of good lists will find that they receive more revenue with a prospect database than they did before. You can negotiate one annual fee with your service bureau, not a cost per thousand record processed. This lets you create as many models as you want, score your records, set up test and control groups, and do all the things you have always wanted to do without worrying about the cost. You can plan ahead. 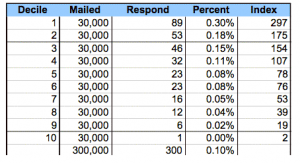 Should you build a prospect database? If you are a large mailer who is trying to acquire new customers, and who is willing to outsource your prospect database to an experienced service bureau, and willing to negotiate new arrangements with your list suppliers, you may find that a prospect database will be highly profitable for you.